Head east on College St toward Yonge St. Turn right onto Yonge St. Turn left onto Gerrard St E (destination will be on the right). Take the 75 southbound bus down Sherbourne. Exit 75 at Gerrard St E. Turn right onto Gerrard St E (destination will be on the left). Head north on Yonge St toward Shuter St. Turn right onto Gerrard St E (destination will be on the right). 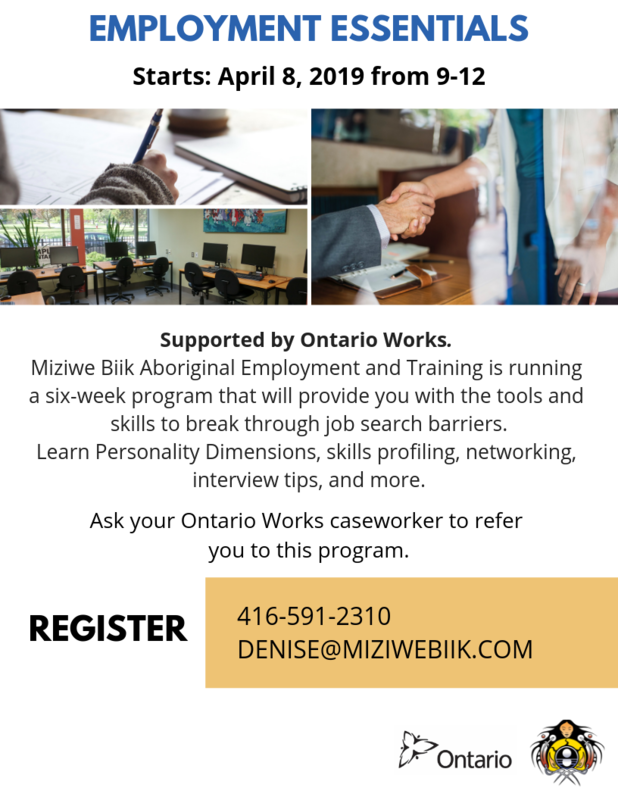 This is a six-week program starting on April 8, 2019, for Miziwe Biik clients who benefit from Ontario Works. Interested? Ask your Ontario Works caseworker to refer you to this program! Attend on April 25 from 10-1. Come and network with employers for a chance to win an Amazon Fire 7 Tablet! Miziwe Biik Aboriginal Employment and Training offers a variety of services including access to a resource centre, employment counselling, and workshops. The Employment Counsellors are the first stop to help you navigate all the services and supports Miziwe Biik has to offer with appointments tailored to support clients and their individual needs. Ten computer workstations with access to the Internet and Microsoft Office 2010 software including Word, Excel, and Powerpoint. Access to a community job and information board. Access to photocopier, local telephone and fax service, as well as information about specialized training providers in Toronto. Miziwe Biik also offers individual and group sessions for all its job-ready clients on resumes and cover letters and online job searches. Speak to our employment staff to discover what program is best for you. Job search supports that include resume and cover letter workshops, interview prep and mock interviews, access to a client-only employment opportunity mailing list, and one-on-one specialized appointments. Clients will be able to access monthly workshops and learn about upcoming programs and events happening at Miziwe Biik. Clients will also be assisted with career decision making which may include the administration and interpretation of career assessments such as Career Cruising, Strong Interest Inventory, Myers-Briggs Type Indicator (MBTI), Personality Dimensions, Guiding Circles as well as values and skills self-assessments. The goal of Employment Ontario‘s Employment Service is to help Ontarians find sustainable employment. It bridges the gap between employers seeking workplace skills and human resources to meet their business needs and individuals seeking employment. The Employment Service can offer you resources, supports and services to respond to career and employment needs of individuals as well as your office or service needs and it can help these individuals on a path to higher skill training and employment. If you’re seeking the skills and human resources that you need to achieve your business goals, then you may be eligible to receive financial incentives to offset the cost of providing work experience opportunities, including apprenticeship training, skill level assessments for participants and wage subsidy. We want to help you get the training, skills and experience to help you achieve your goals. We also want to connect people looking for work with employers looking for workers. For additional information on Employment Ontario services visit their website or call 416-326-5656. What can I expect on my first visit to Miziwe Biik? Effective August 1, 2001, Miziwe Biik has changed slightly their service model to better serve you. This change requires that you complete an Employment Ontario application alongside our Client Registration form. You will then be given an appointment time to meet with one of our Employment Counsellors. We have up-to-date computers, printers, fax machines, employment resources and a job board available to every client. Can I train for a new career? If you meet the correct criteria, you may be eligible to submit a Second Career application or access the Aboriginal Skills and Employment Training Strategy (ASETS) program.